The dialogue regarding the ordination of women began in 1953 at General Assembly. The Church was presented with an Overture from the Synod of Manitoba, addressing the issue of ordination of women, and their place in the Church. In response to this, a Special Committee on the Place of Women in the Church was appointed. This Committee was tasked with tackling the question of ordination of women as both ministers and elders. Originally, four men were appointed to the committee, with Rev. Louis H. Fowler appointed Convener. The majority of their first year was spent determining the main focus of the Committee, and at the 1954 General Assembly, required clarification on their goals. At the 1954 General Assembly they also received approval for the authority to consult representative women of the Church, albeit with restrictions. Women were allowed on the Committee solely as consultants, not as voting members, and the first women in 1955 were not even recorded. Do you favour the ordination of women to the ruling eldership? Do you favour the ordination of women to the Ministry? Click to enlarge. Results of the 1955 Questionnaire. Printed in 1956 Acts and Proceedings. In an attempt to gain an understanding of what the majority of congregations thought, the Committee sent their 1955 Report , with two key questions down to all presbyteries for analysis and feedback. Their two questions were, “Do you favour the ordination of women to the ruling eldership?” and “Do you favour the ordination of women to the ministry?” The results of these questions were presented at the 1956 General Assembly. 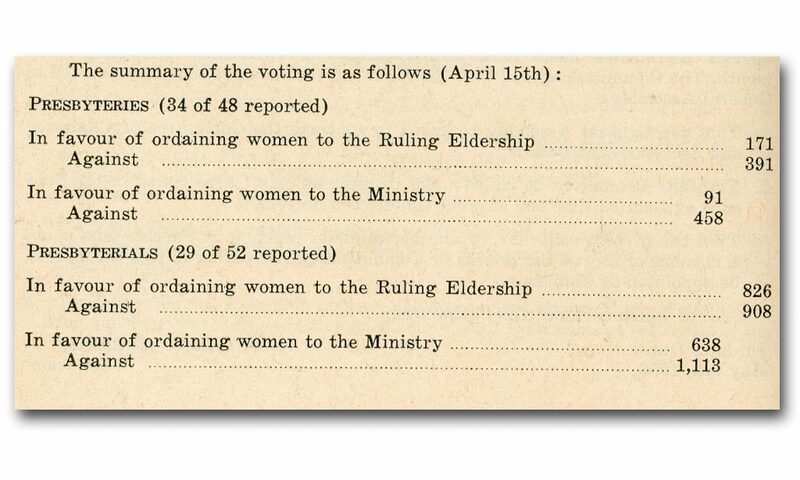 Of the presbyteries that responded (34 of 48), 171 were in favour of women as ruling eldership with 391 opposed. 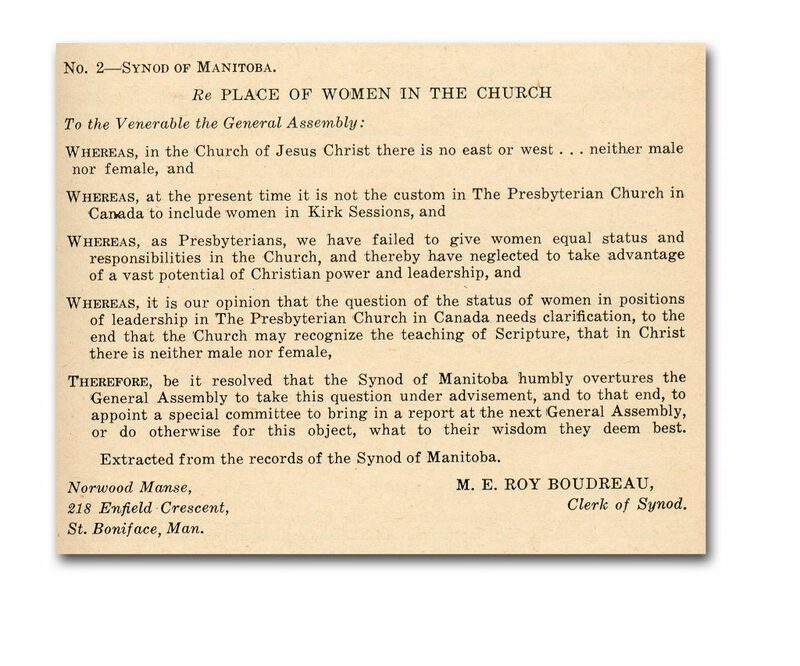 In regards to women as ministers, 91 presbyteries were in favour while 458 were opposed. 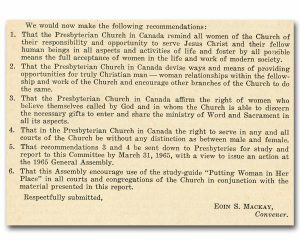 These responses informed the Committee’s decision and ultimately came to the conclusion that the Church was not ready to accept women in these positions, and in 1956 recommended specific action be deferred. The purpose of The Committee on the Place of Women in the Church was not solely the issue of the ordination of women. They were also concerned about women’s roles in general and equality within the Church. Following the deferral on the issue of ordination, the Committee turned its attention to women’s roles and their voices within the Church. Specifically, they considered the ordination of deaconesses and female missionaries. 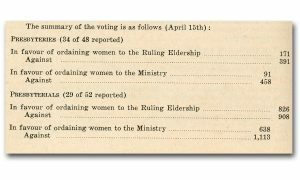 Questionnaires were sent out polling presbyteries on the possibility of ordaining deaconesses. While ultimately deaconesses were not ordained, this discussion brought to light some concerns about the unity and equality in the Church. As a result, in 1959, the Committee on the Place of Women in the Church proposed what they called a “Council Plan.” The aim of this plan was to try to bring women into the administrative levels of the Church in an attempt to strive for more equality. This plan was not well received at the General Assembly. Also in 1959, the World Council of Churches joined the dialogue on the ordination of women, and released a document on the subject, but declined to take an official stand on the matter. Instead, the report attempted to objectively state the facts for and against the ordination of women. 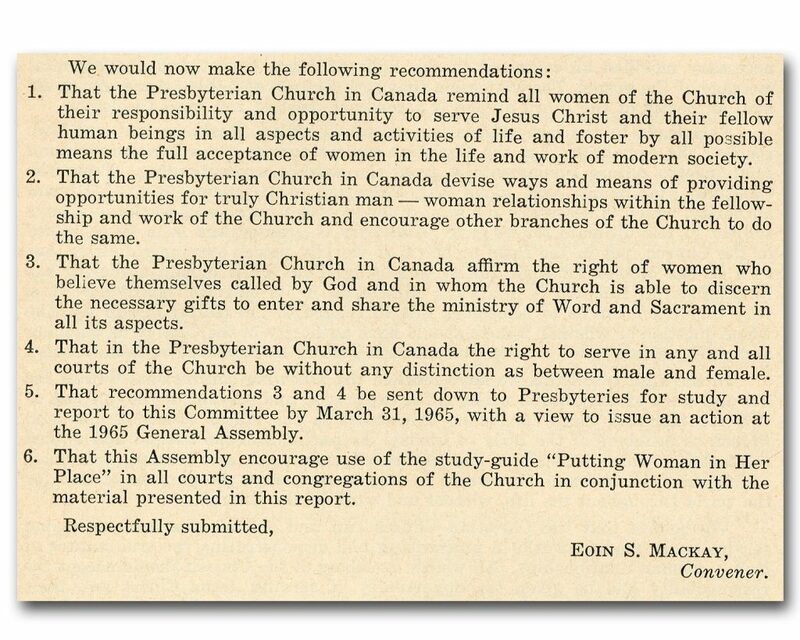 Under the new leadership of Eoin S. MacKay, in 1960 the Committee on the Place of Women in the Church asked the General Assembly to resend the questionnaire to the presbyteries under the Barrier Act, and as in 1955, failed to get a majority vote. Following this result, they recommended waiting two years before making a decision. During that two year interval, the Committee on the Place of Women in the Church joined with the Committee of Articles of Faith in order to study the doctrine concerning women in the Church. Together, they released a pamphlet entitled, Putting Woman in Her Place and in 1963 it was recommended at General Assembly that this pamphlet be sent to all presbyteries for study. The Committee on the Place of Women in the Church realized they had a responsibility not to tell the church what they ought to do, but rather to help the “church find and act in accordance with the truth of the Gospel in regard to the place of women in her life and work.” This pamphlet was an important tool to help guide the churches to examine the scripture and doctrine surrounding women in the church, and to spark discussions in the Church. By 1964, the Committee shared their decision on the subject, stating that there “can be no distinction in the status accorded men and women as members of the Body of Christ” (Acts and Proceedings 1964, 386). They put forth four recommendations, to be sent to all courts and congregations for feedback. Most churches were in favour of recommendations 1 and 2 but by the 1965 General Assembly, it was thought another study on recommendations 3 and 4 would be necessary before making any decisions. Click to enlarge. Recommendations presented at the 1964 General Assembly. In 1965 the question of the ordination of women to the ministry and to the eldership was sent down one final time under the Barrier Act, with a decision to be made at the 1966 General Assembly. 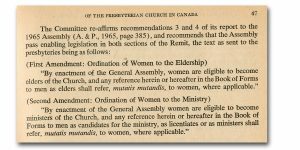 Based on the results of the questionnaire, in 1966, the General Assembly motioned to amend the constitutional rules to allow for the ordination of women to the eldership and to the ministry. Despite hearing from dissenters, it was moved and enacted into church law. Click to enlarge. 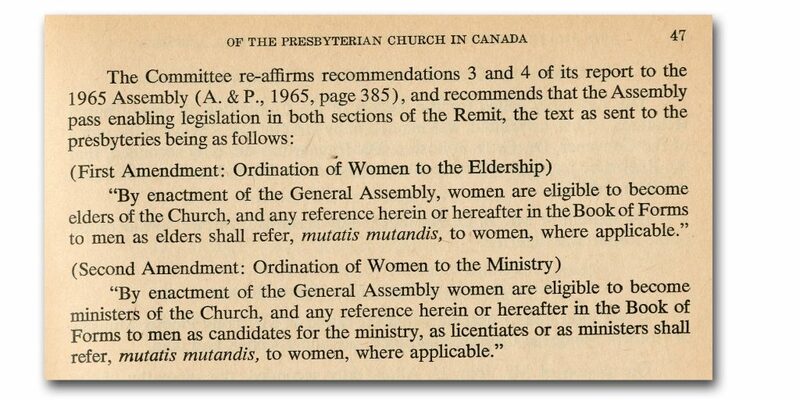 1966 decision to ordain women as printed in Acts and Proceedings.